Paquito D’Rivera defies categorization. The winner of fourteen GRAMMY Awards, he is celebrated both for his artistry in Latin jazz and his achievements as a classical composer. Born in Havana, Cuba, he performed at age 10 with the National Theater Orchestra, studied at the Havana Conservatory of Music and, at 17, became a featured soloist with the Cuban National Symphony. As a founding member of the Orquesta Cubana de Musica Moderna, he directed that group for two years, while at the same time playing both the clarinet and saxophone with the Cuban National Symphony Orchestra. He eventually went on to premier several works by notable Cuban composers with the same orchestra. Additionally, he was a founding member and co-director of the innovative musical ensemble Irakere. With its explosive mixture of jazz, rock, classical and traditional Cuban music never before heard, Irakere toured extensively throughout America and Europe, won several GRAMMY nominations (1979, 1980) and a GRAMMY (1979). His numerous recordings include more than 30 solo albums. In 1988, he was a founding member of the United Nation Orchestra, a 15-piece ensemble organized by Dizzy Gillespie to showcase the fusion of Latin and Caribbean influences with jazz. D’Rivera continues to appear as guest conductor. A GRAMMY was awarded the United Nation Orchestra in 1991, the same year D’Rivera received a Lifetime Achievement Award from Carnegie Hall for his contributions to Latin music. 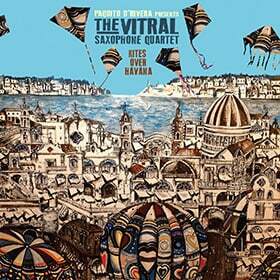 Additionally, D’Rivera’s highly acclaimed ensembles- the Chamber Jazz Ensemble, the Paquito D’Rivera Big Band, and the Paquito D’Rivera Quintet are in great demand world wide. While Paquito D’Rivera’s discography reflects a dedication and enthusiasm for Jazz, Bebop and Latin music, his contributions to classical music are impressive. They include solo performances with the London Philharmonic, the London Symphony Orchestra, the Warsaw Philharmonic Orchestra, the National Symphony Orchestra, the Baltimore Symphony, the Florida Philharmonic Orchestra, and the Brooklyn Philharmonic. He has also performed with the Puerto Rico Symphony Orchestra, the Costa Rica National Symphony, the Simon Bolivar Symphony Orchestra, the Bronx Arts Ensemble, and the St. Luke’s Chamber Orchestra, among others. In his passion to bring Latin repertoire to greater prominence, Mr. D’Rivera has successfully created, championed and promoted all types of classical compositions, including his three chamber compositions recorded live in concert with distinguished cellist Yo-Yo Ma in September 2003. The chamber work "Merengue," from that live concert at Zankel Hall, was released by Sony Records and garnered Paquito his 7th GRAMMY as Best Instrumental Composition 2004. In addition to his extraordinary performing career as an instrumentalist, Mr. D’Rivera has rapidly gained a reputation as an accomplished composer. The prestigious music house, Boosey and Hawkes, is the exclusive publisher of Mr. D’Rivera’s compositions. Recent recognition of his compositional skills came with the award of a 2007 John Simon Guggenheim Fellowship in Music Composition, and the 2007-2008 appointment as Composer-In-Residence at the Caramoor Center for Music and the Arts with the Orchestra of St. Luke’s. As part of the Caramoor Latin American music initiative, Sonidos Latinos, D’Rivera’s new concerto for double bass and clarinet/saxophone, "Conversations with Cachao," pays tribute to Cuba’s legendary bass player, Israel "Cachao" Lopez. D’Rivera’s works often reveal his widespread and eclectic musical interests, which range from Afro-Cuban rhythms and melodies, including influences encountered in his many travels, and back to his classical origins. Inspiration for another recent composition, "The Cape Cod Files", comes from such disparate sources as Benny Goodman’s intro to the Eubie Blake popular song "Memories of You", Argentinean Milonga, improvisations on the music of Cuban composer Ernesto Lecuona, and North American boogie-woogie. His numerous commissions include compositions for Jazz at Lincoln Center, the Library of Congress, the National Symphony Orchestra and Rotterdam Philharmonic, the Turtle Island String Quartet, Ying String Quartet, the International Double Reed Society, Syracuse University, Montreal’s Gerald Danovich Saxophone Quartet, and the Grant Park Music Festival. Another commission came about through ensemble Opus 21’s interest in building bridges between audiences of different backgrounds. Dedicated to the works and art music of the 21st century, Opus 21 commissioned "The Chaser" and premiered it in May, 2006. In 2005, Imani Winds, a woodwind quintet committed to the exploration of diverse world music traditions and the broadening of the traditional wind quintet literature, commissioned "Kites." This work personifies freedom and the vision that liberty and independence have a foundation through culture and music. Just as a kite may fly freely, its path continues to be bound to the earth–its foundation, by the string. Paquito D’Rivera is the author of two books: My Sax Life, published by Northwestern University Press, and a novel, Oh, La Habana, published by MTeditores, Barcelona. He is the recipient of the NEA Jazz Masters Award 2005 and the National Medal of the Arts 2005, as well as the Living Jazz Legend Award from the Kennedy Center, Washington, D.C. in 2007. His numerous other honors include Doctorates Honoris Causa in Music (from the Berklee School of Music in Boston, the University on Pennsylvania), and the Jazz Journalist Association’s Clarinetist of the Year Award in both 2004 and 2006. In 2008, Mr. D’Rivera received the International Association for Jazz Education President’s Award and the Frankfurter Musikpreis in Germany, the Medal of Honor from the National Arts Club in 2009. In 2010, he was named a Nelson A Rockefeller Honoree and given the African-American Classical Music Award from Spelman College. He received his 10th and 11th GRAMMY this year for Panamericana Suite as Best Latin Album and Best Classical Contemporary Composition, adding to his previously awarded 8th and 9th GRAMMY for Riberas (Best Classical Recording) and Funk Tango (Best Latin Jazz Album 2008). Mr. D’Rivera is the first artist to win Latin GRAMMYs in both Classical and Latin Jazz categories– for Stravinsky’s Historia del Soldado (L’Histoire du Soldat) and Brazilian Dreams with New York Voices. He has served as artistic director of jazz programming at the New Jersey Chamber Music Society and continues as Artistic Director of the famous world-class Festival Internacional de Jazz de Punta Del Este in Uruguay and the DC Jazz Festival in Washington, DC., and add to that now in its second year, Jazz Patagonia 2013 in Chile. In 1999, and in celebration of its 500 year history, the Universidad de Alcala de Henares presented Paquito with a special award recognizing his contribution to the arts, his humane qualities, and his defense of rights and liberties of artists around the world. The National Endowment for the Arts website affirms "he has become the consummate multinational ambassador, creating and promoting a cross-culture of music that moves effortlessly among jazz, Latin, and Mozart."